Good Eats 'n Sweet Treats: Chicken, Garlic, and Sundried Tomato Pasta... and a Winner! Chicken, Garlic, and Sundried Tomato Pasta... and a Winner! This is one of my favorite go-to dinners when I'm craving pasta but want something other than a regular red sauce or meat sauce. It is creamy and delicious but not overly heavy like an alfredo sauce can be sometimes. I've made it so many times now that I've adjusted it to suit our tastes... namely, I've cut back on the butter, added more garlic, milk, and sun dried tomatoes, and some crushed red pepper to give it a kick! I've also found that if I slice the chicken very thin, I don't have to precook it and I can simply add the chicken in raw, bring the sauce to a quick boil, and then lower the temp and let it simmer for those last 6-8 minutes. 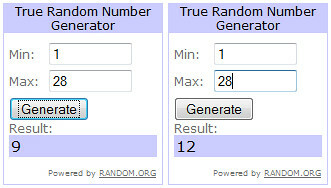 And, without further ado, the winners of the Kettle Confections giveaway are lucky #9 and #12. Congrats to Marcy of minus tomato and "ikkinlala." I'll be contacting you shortly and you have until midnight (CST) January 22nd to email me your mailing address; if I do not hear from you by then, I will select alternate winners. Enjoy! In a large pot with boiling salted water cook farfalle pasta until al dente. Drain. Meanwhile, melt butter in a large saucepan. Add garlic cloves and cook until garlic browns. Add the cream of chicken and cream of mushroom soup and milk, stirring until smooth. Stir in the dried parsley, salt, and ground fresh pepper (as well as the crushed red pepper if you are using it). Let simmer for 2 to 3 minutes. Add bite size chicken pieces and hydrated sun dried tomatoes. Simmer for 6 to 8 minutes. Mix in grated Romano cheese. 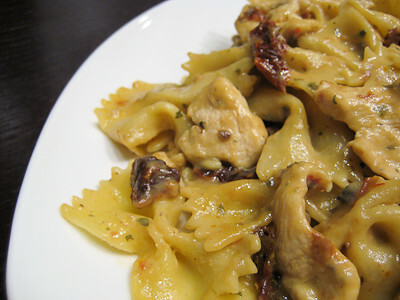 Toss cooked and drained pasta with chicken sauce. Serve warm. Jamie , this pasta i must do. Made this for dinner tonight - it was pretty quick & delicious! This looks sooo good. despite brown food being tough to photograph you did a great job! i think it looks great--the mere presence of sundried tomatoes moves it way up in the rankings! That looks really delicious - and nice and quick! This was tonight's dinner! I added a bag of spinach and it turned out great! I made this last night for a dinner party and it was a huge hit. I did make one change to the recipe by adding a chopped onion. Thanks for sharing.